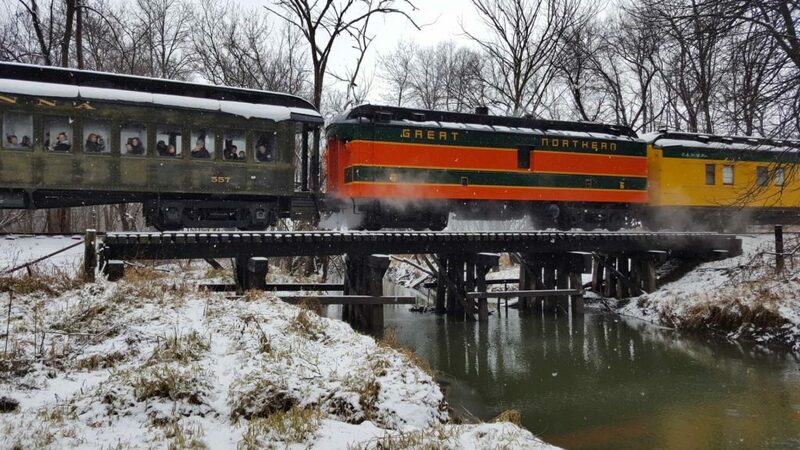 Mid-Continent Railway Museum will soon be entering its 56th year of operating historic railroad equipment for the public on its 4.2-mile ex-Chicago & North Western branch line at North Freedom. 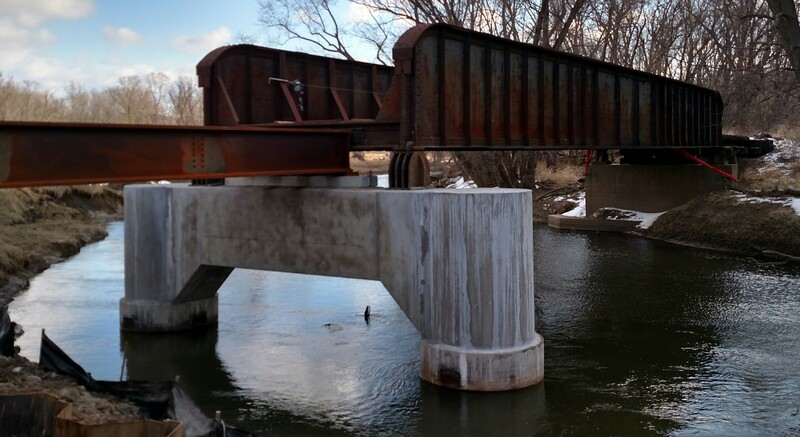 Located just 500 feet east of Mid-Continent’s North Freedom depot and between the depot and the museum’s interchange with the former Chicago & North Western mainline, Mid-Continent’s tracks cross the muddy Baraboo River using a museum-owned bridge. 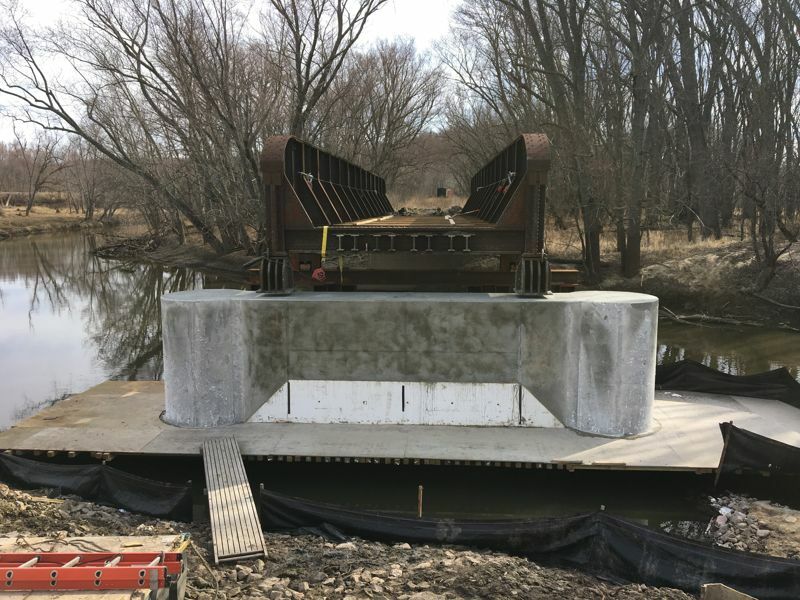 The Baraboo River bridge, also known by its C&NW designation Bridge #386-1/2A, is comprised of three sections – an approach span on each side and the main center span. 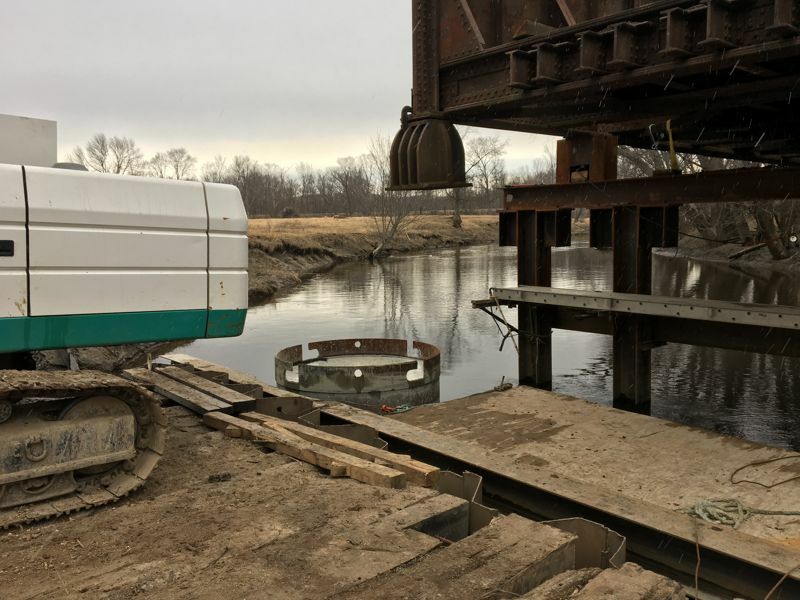 The main (center) section is an 85-foot, 105-ton steel riveted thru plate girder span that up until now has been resting on a combination of wooden (original) and concrete (built in 1977) piers. The bridge was built in 1929, replacing the original wooden Howe design pony truss bridge installed in 1903. 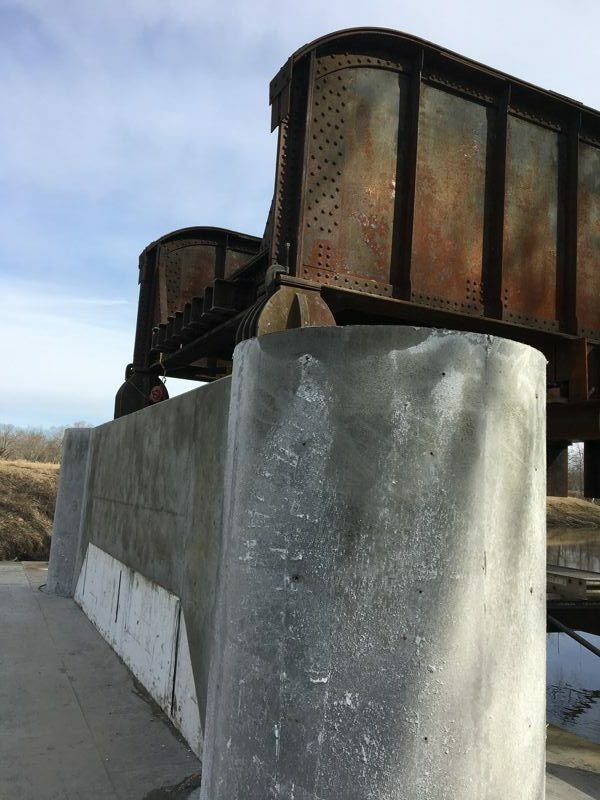 The aging bridge was subject to weight restrictions in more recent times. 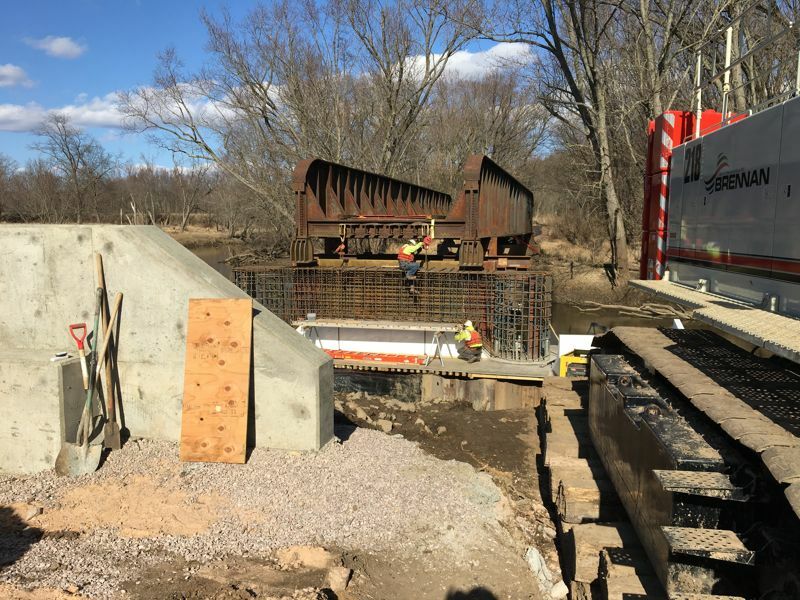 Finally in June 2008, record flooding of the Baraboo River damaged the bridge to the point of requiring it to be completely taken out of service. The inability to cross the bridge severed Mid‑Continent’s link to the state-owned line which is operated by the Wisconsin & Southern Railroad (WSOR), thus making it impossible for rail shipments of coal, ballast, and other supplies to reach MCRM. 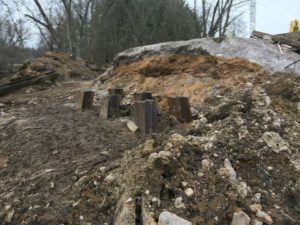 It also prevented Mid‑Continent’s trains from accessing WSOR’s network, eliminating any possibility of excursions beyond the museum’s own North Freedom-La Rue spur line. Additionally, some of Mid‑Continent’s railcars became trapped on the east side of the bridge, cut off from the museum. 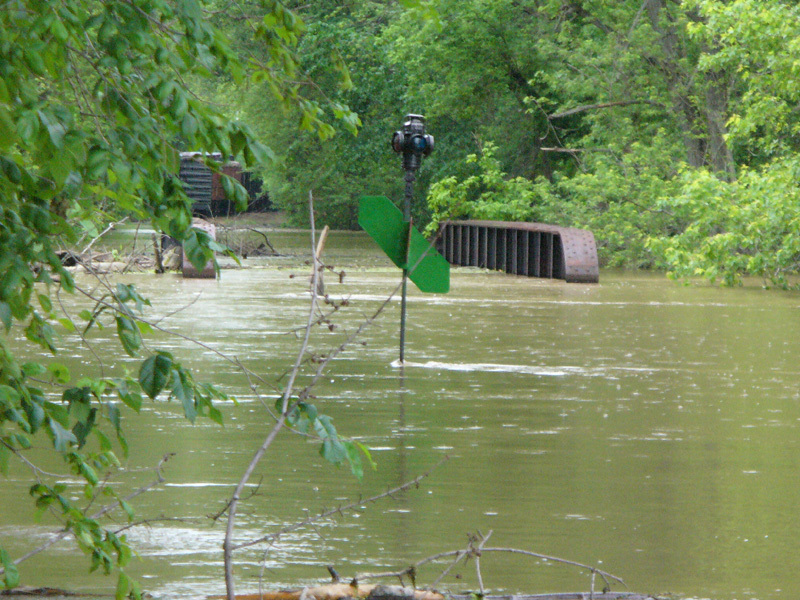 The Baraboo River bridge girders are just visible above the water at the height of severe flooding that damaged the bridge in June 2008. A string of cars on the other side can be seen in the distance and have remained stranded ever since. Jim Conner photo. Yet another reason the bridge needed to return to service soon was the impending return of steam locomotive #1385. At Mid-Continent, each demonstration train ride starts with the locomotive in the front of the train when departing North Freedom. 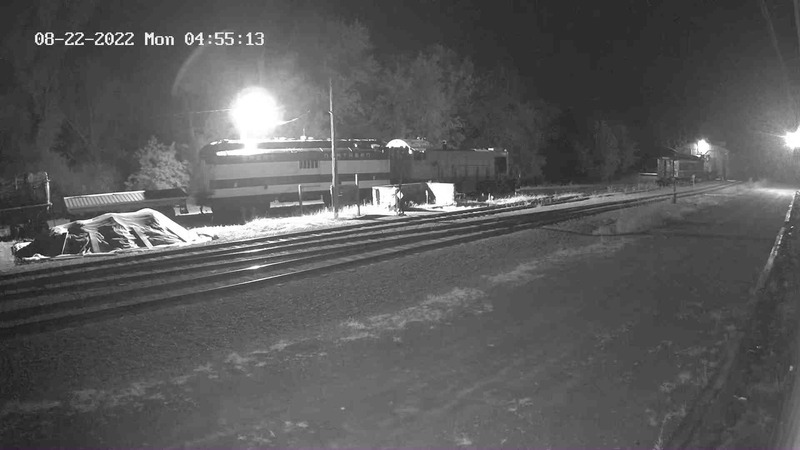 Upon reaching the far end of the line at Quartzite Lake, crews disconnect the locomotive and use a passing track there to slip past the train cars and connect the locomotive to what was previously the last car of the train. The locomotive then pulls (rather than pushes) the train back to North Freedom. At North Freedom, another passing track is used to get the locomotive back to the opposite (front) end of the train again so it is ready for the next departure. This “run-around” maneuver, however, would not be possible with steam locomotive #1385 unless the bridge were back in operation. Limited clearance between the end of the North Freedom passing track and the start of the Baraboo River bridge allows just enough room for the shorter diesel locomotives to complete the maneuver without encroaching onto the bridge span. The longer #1385 would not be able to get to the passing track without at least partially driving onto the bridge span. 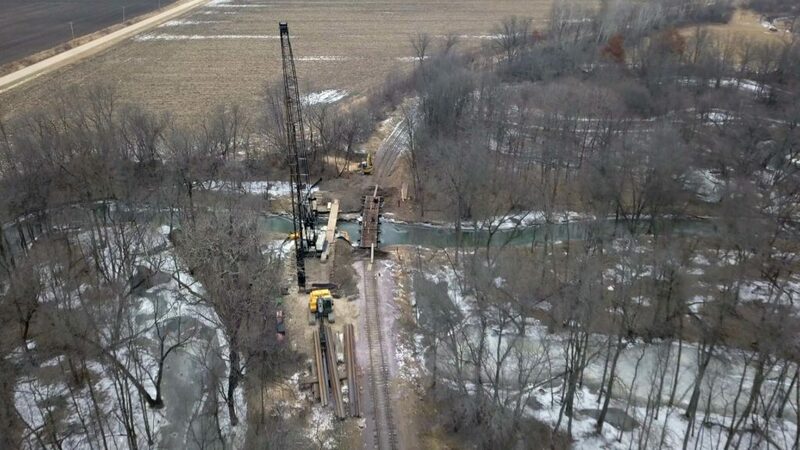 Without the bridge operational, #1385 would instead have to push its trains back from the end of the line. This drastically impairs the visibility of the engineer to see what lies ahead since there would be anywhere from three to nine cars blocking their view of where the train is going. Also, because the headlight and whistle would be located at the back of the train rather than the front, the train would be required to stop short of each and every public road crossing so that a crewmember can “flag the crossing.” This adds labor costs, reduces fuel efficiency, and causes unnecessary wear on the equipment. 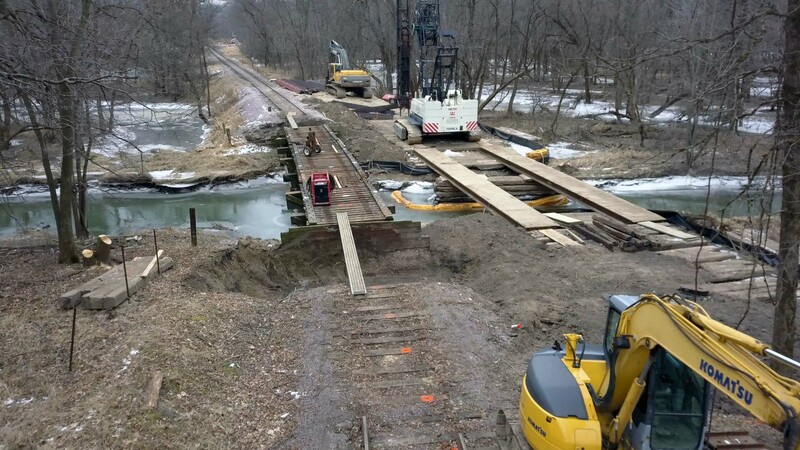 Fundraising efforts in the wake of the flood focused on repairing the trains, buildings, and the remainder of the museum-owned route on which the demonstration trains operate. With the museum once again fully operational, fundraising attention next turned to resuming restoration of steam locomotive #1385. 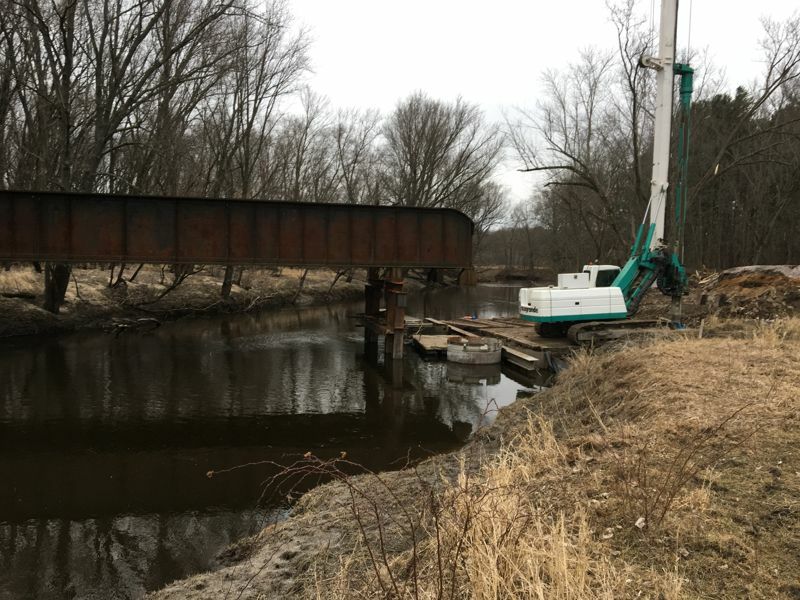 With the steam engine soon entering the final stages of restoration, fundraising attention was able to finally be turned to the Baraboo River Bridge. 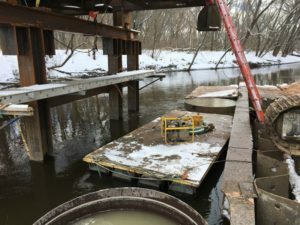 Credit goes to Harvey H., a Mid-Continent fan living in Florida, for believing in the importance of the Baraboo River bridge project enough to make a modest unsolicited donation and becoming the very first person to make a financial contribution for the bridge well before the project was announced. 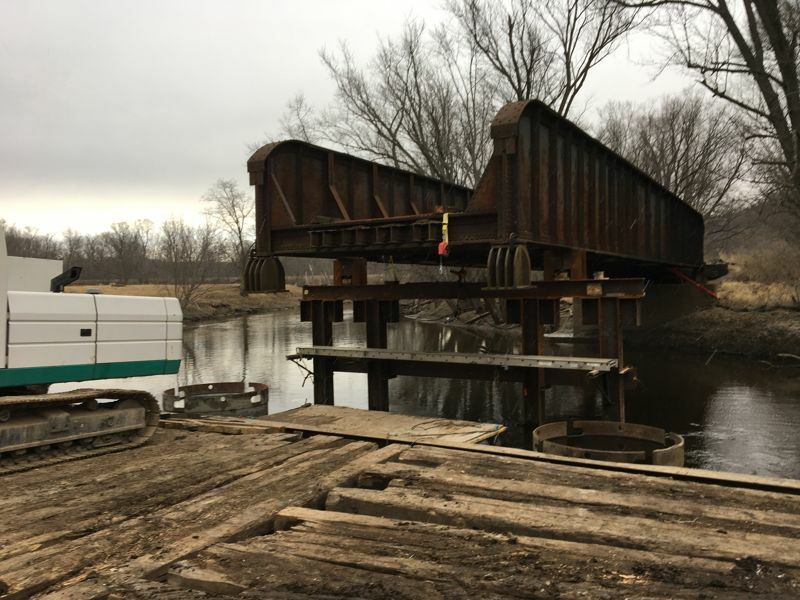 Harvey’s trust in Mid-Continent to put his donation to good work was not in vain and in late 2016 and 2017 museum leaders were able to secure two major grants to allow rehabilitation of the bridge to move forward. 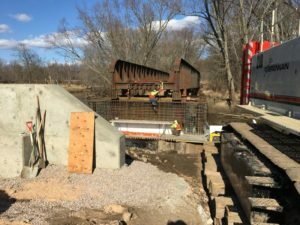 Initial engineering estimates predicted bridge rehabilitation costs would be roughly $1.2 million. 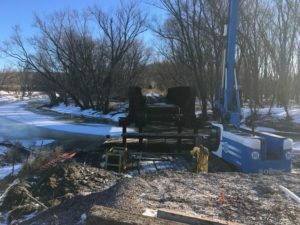 The first breakthrough for funding was a $600,000 pledge by the Wagner Foundation, a private foundation and major supporter of the museum’s ongoing C&NW #1385 steam locomotive restoration project. 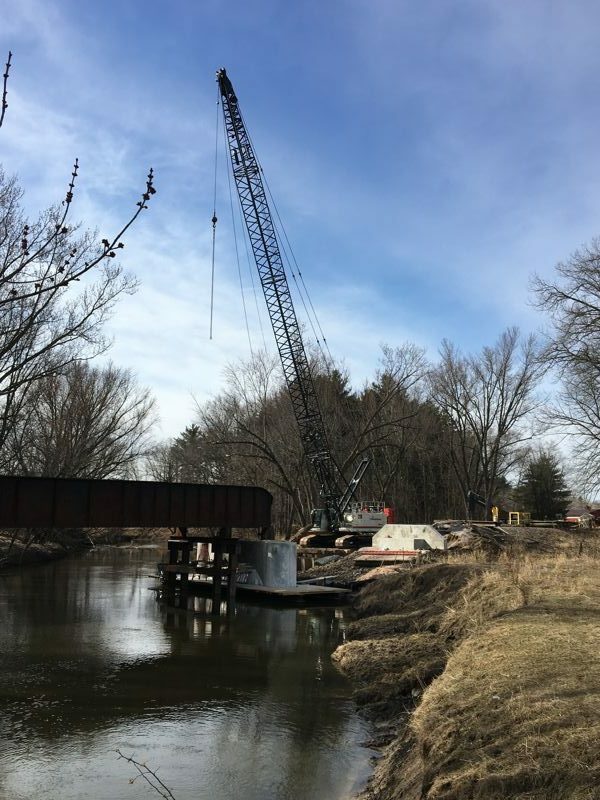 With a healthy start to the fundraising, bids were then collected from a number of bridge contractors and a winner carefully selected, providing a firm price of $677,000 to repair the bridge. With the lower than expected price tag, the end goal was suddenly very much within reach. 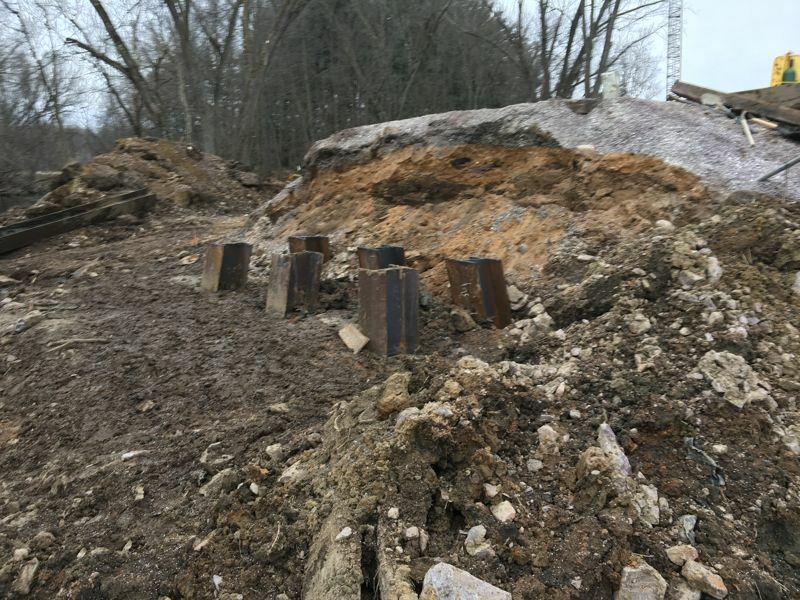 The final $77,000 was secured in late 2017 via a grant from Sauk County which officially allowed the project to be green-lit. 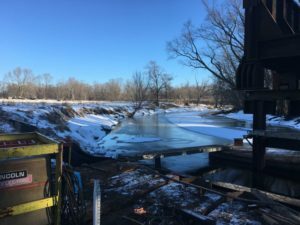 In January 2018, a mere three months after Mid-Continent secured the needed funding, the J.F. Brennan Company mobilized to begin rehabilitation work on the bridge. 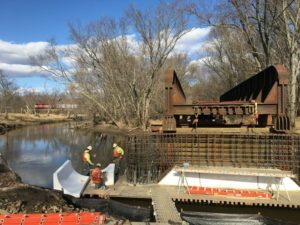 As of April 3, 2018 construction progress is now more than 50% done and is expected to be fully completed by late May or early June 2018. Below is a brief photo montage showing work completed to date. Photos courtesy Pete Schierloh. A view of the existing through plate girder (TPG) span that will be preserved resting on a temporary support bent after the existing timber Pier 2 was demolished. 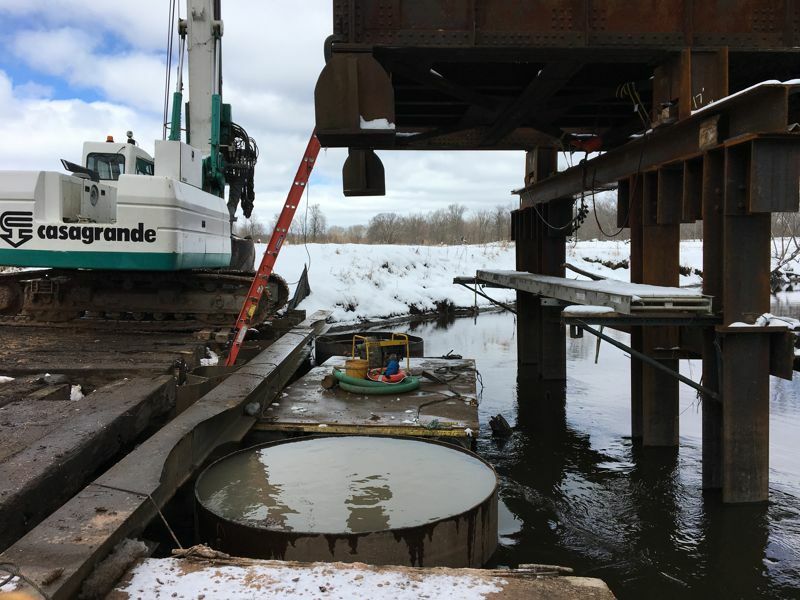 Visible near the water surface are the tops of the permanent steel casing for the two 7’-0” diameter drilled caissons that form the foundation of replacement Pier 2. Pete Schierloh photo. 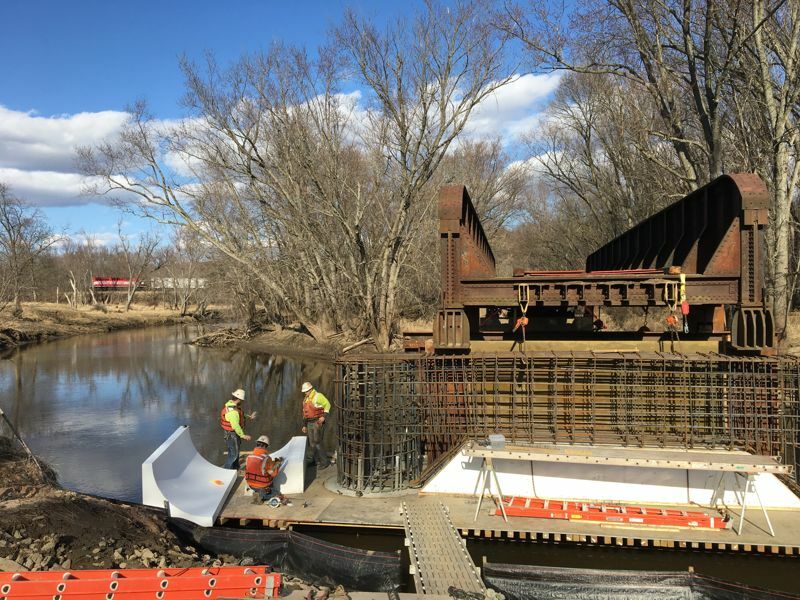 A close-up showing the construction of the downstream caisson. 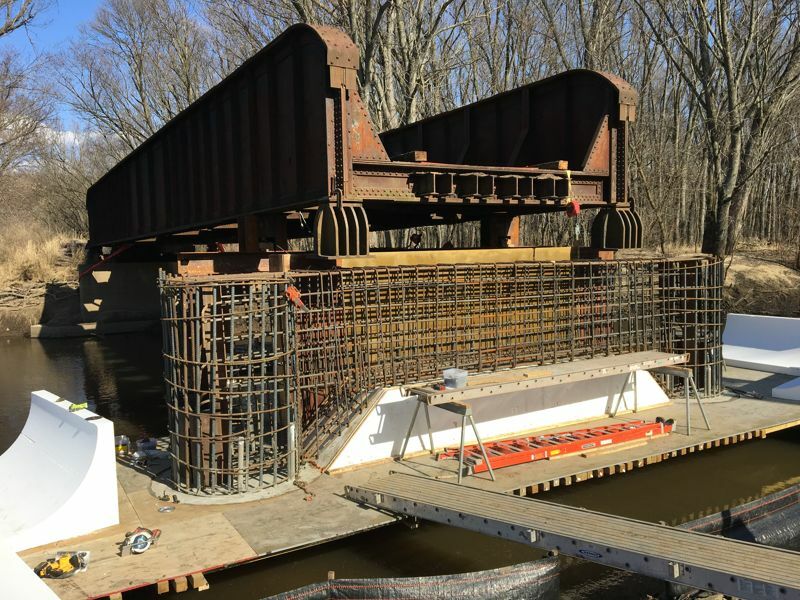 Each caisson was drilled no less than 7’-0” into solid bedrock to provide a sound foundation. The drill arm, or kelly bar, of the drill rig is visible to the right in the photo. 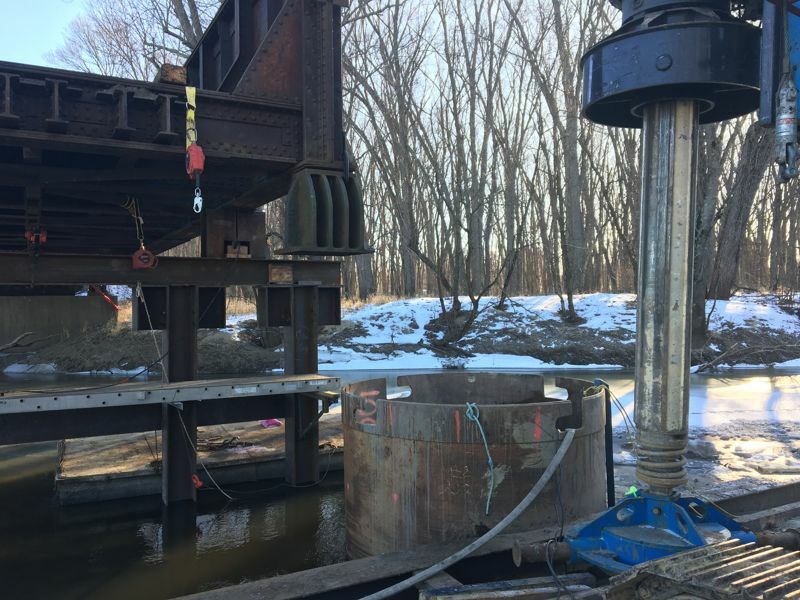 The casing pipe visible in the photo was a temporary casing that was used to aid in the installation of the permanent casing. It was removed once the permanent casing was set shortly after this photo was taken. Pete Schierloh photo. After the caissons were drilled down into bedrock, a heavy reinforcing steel cage was lowered into the caisson. The reinforcing is designed to resist flood forces, ice impacts, and the force of the train starting and stopping on the bridge. All of these forces are attempting to overturn the pier and some of them are rather large forces, so the amount of reinforcing steel required is substantial. Pete Schierloh photo. 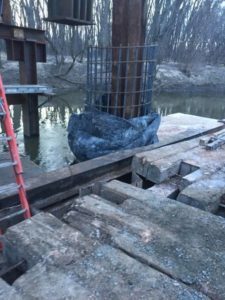 Once the concrete in the caisson was sufficiently cured, work began on the pier cap. The pier cap must transfer the weight of the spans and train out from the bearings to the caissons. 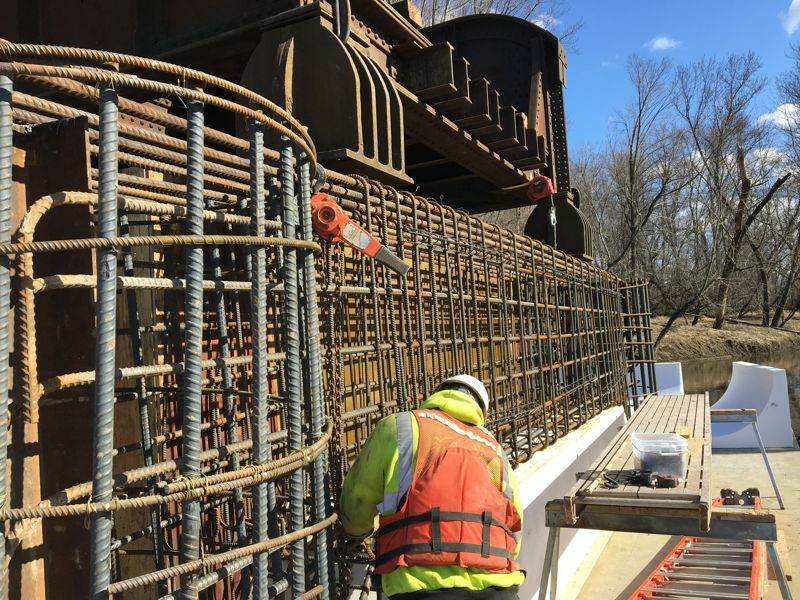 The design loads in this case are very large, well into the hundreds of thousands of pounds, so once again a significant amount of reinforcing steel is required. This photo also shows the very little freeboard that was available above the river. 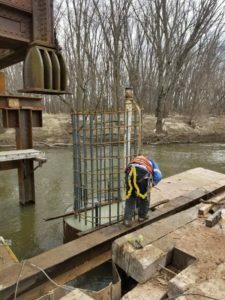 Even a small increase in water level could easily overtop the bottom of the formwork. Pete Schierloh photo. 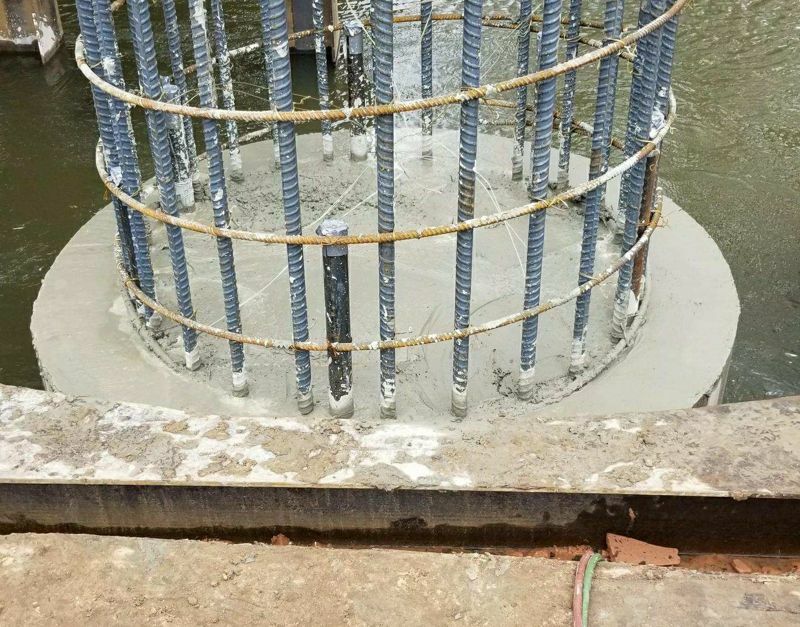 The pier cap after the completion of the concrete placement and partial stripping of the formwork. 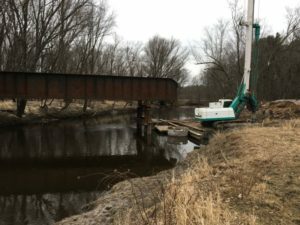 At this point the crew has started work replacing the timber tie deck on the TPG span while they wait for the concrete to reach sufficient strength to support the dead weight of the TPG span. Once the concrete has enough strength, the TPG span will be lowered down on top of the new pier and the temporary steel support bent will be removed. After decades of being vulnerable to flood and ice damage to the timber pier that once supported it, this historic TPG span now rests on a stable foundation that is far more resilient. The new pier contains 87 cubic yards of 5000 psi concrete, 15,000 pounds of reinforcing steel, and nearly 11,000 pounds of steel casing pipe. Pete Schierloh photo. All photos courtesy Pete Schierloh unless otherwise indicated. 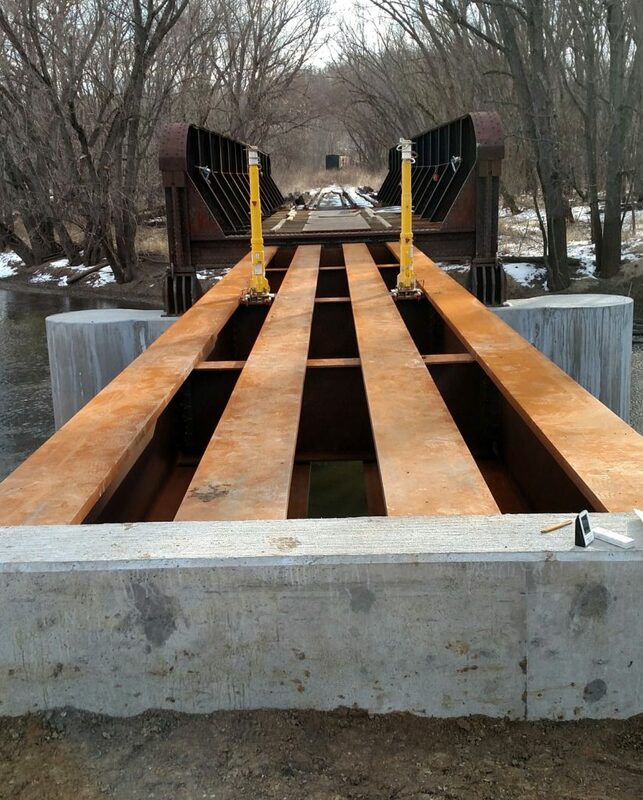 New approach span beams. 4/6/2018. Nancy Kaney photo. New pier and approach span. 4/6/2018. Nancy Kaney photo. The above time-lapse video shows how construction crews moved the crane across the bridge on April 26, 2018 to begin rehabilitation of the east side of the bridge. 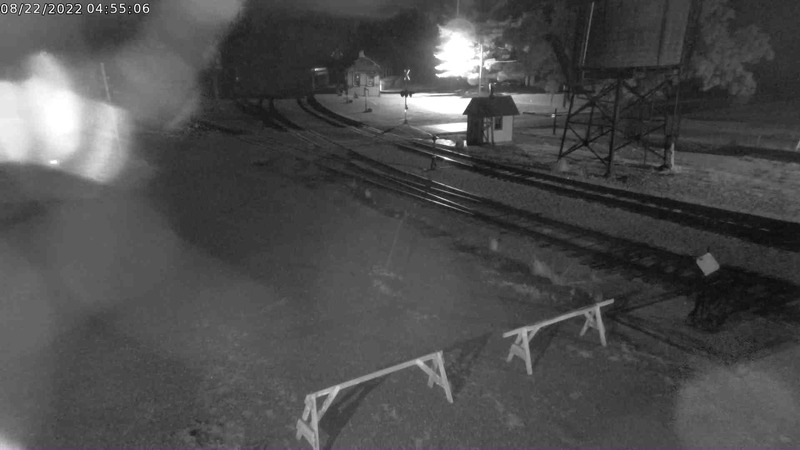 A webcam has been placed along the museum’s passenger platform and exhibit area pointing north toward the Baraboo River bridge worksite. The image updates every few seconds. For your safety, if visiting Mid-Continent please obey all warning signs and do not enter the restricted worksite area. 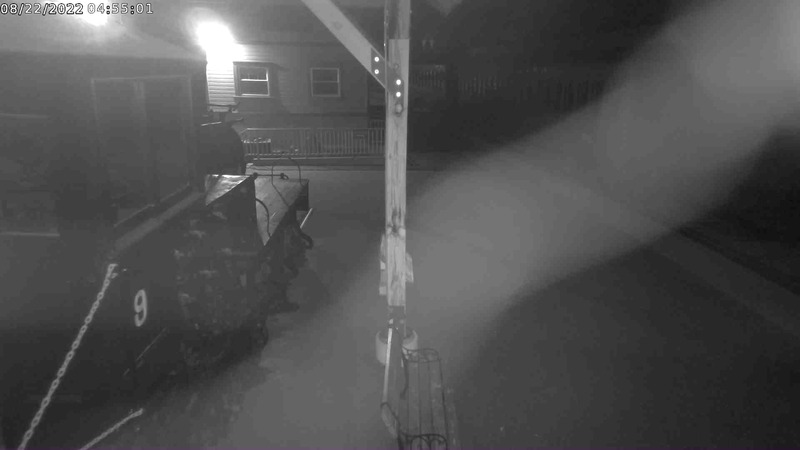 This above images and the live camera are provided so you can see what’s going on without putting yourself in danger.